Residents lined up on along the wharf to watch what turned out to be a spectacular blaze. The fire spread quickly through the ship so fast that even though Duluth fire fighters and harbor tugs joined the Winslow’s crew members in fighting the flames it was a losing battle. The 230-foot Winslow was moored that day at the St. Paul and Duluth Railroad dock and workers were busy unloading a cargo of barrels of brown sugar when someone smelled smoke and a small fire was discovered below deck. One version of the story said the fire was first noticed in the ship’s wood bunker. 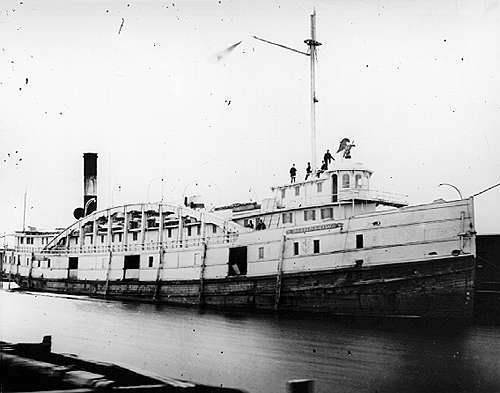 The Winslow went aground at Lakeside, just east of Duluth, just two days before the fire and some have theorized that the hull sustained a small leak and the water mixed with lime, which also was part of the cargo. Lime will burn when it mixes with water. The fire quickly got away from the Winslow’s crew and the Duluth Fire Department was summoned. But alas, the fire hoses brought to the scene by the fire fighters were too short to reach the ship from the nearest hydrants. The department lacked pumps that could have been used to pump water directly from the harbor. The harbor tug Sutton joined the fight and began pumping water on the blaze. But by then the fire was threatening to spread to the dock and nearby warehouses so the harbormaster ordered the Sutton to tow the burning vessel across the bay and into the mud flats near Minnesota Point. There the Sutton was joined by other tugboats with fire pumps and the fight to extinguish the flames continued. But in the end, the Winslow was lost. The old boat burned to the waterline. In the end, even the hull was determined unfit to be salvaged. The remains of the wreck were pulled up the St. Louis River and into shallow water near the Minnesota Power & Light Company plant where they remain to this day. The Winslow was owned by the Erie and Western Transportation Company at the time of the fire. It was launched at Cleveland and designed as both a freight and passenger carrier in 1863. It was rebuilt in 1880.